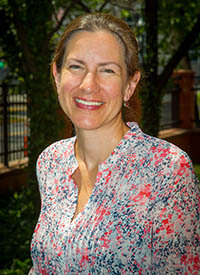 Andrea Hetling is an Associate Professor at the Edward J. Bloustein School of Planning and Public Policy at Rutgers University. Dr. Hetling’s research interests are in the area of domestic social policies that target disadvantaged or marginalized groups. She is particularly interested in evaluating the implementation and outcomes of social programs designed to reduce poverty, inequality, and family violence. She has conducted quantitative and qualitative research on TANF time limits and diversion programs, the Family Violence Option, public opinion of welfare reform, and permanent supportive housing programs. Her work has appeared in various journals including Housing Policy Debate, the Journal of Social Policy, Social Science Quarterly, Social Service Review, and Violence Against Women. Dr. Hetling holds a number of leadership positions in the field of poverty research including appointments as an Editorial Advisory Board Member of the Journal of Children & Poverty and a Research Affiliate of the National Poverty Center at the University of Michigan. 2016: Hetling, A. & Botein, H. Home “safe” home: The challenges of housing solutions for survivors of intimate partner violence. Rutgers University Press. 2016: Hetling, A. (2015). Technology and Public Policy. in M.A. Odekon (Ed. ), The SAGE Encyclopedia of World Poverty, 2nd edition. 2016: Hetling, A. & Hoge, G. (2015) Economic Self-Sufficiency. in in M.A. Odekon (Ed. ), The SAGE Encyclopedia of World Poverty, 2nd edition. 2017: Hetling, A., Postmus, J.L., & Kaltz, C. (2016). A randomized controlled trial of a financial literacy curriculum for survivors of intimate partner violence. Journal of Family and Economic Issues, 37 (4), 672-685. 2016: Hetling, A., Hoge, G.L., & Postmus, J.L. (2016). What is economic self-sufficiency? Validating a measurement scale for policy, practice, and research. Journal of Poverty, 20 (2), 214-235. 2016: Hetling, A., Kwon, J., & Saunders, C. (2015). The relationship between state welfare rules on economic disconnection among low-income single mothers. Social Service Review, 89 (4), 653-685. 2014: Hetling, A., Kwon, J., & Mahn, E. (2014). Income packaging and economic disconnection: Do sources of support differ from other low-income women? Journal of Sociology and Social Welfare. 41 (3), 85-112. 2014: Postmus, J.L., SilvaMartinez, E., Hetling, A., & Danis, F. (2013). Evaluating the Impact of the “Moving Ahead Through Financial Management” Curriculum: The Advocate Perspective. The Allstate Foundation. Management” Curriculum: A Randomized Control Study. The Allstate Foundation.